If one wants to explain why former Minister of the Niger Delta, Godsday Orubebe, of the People’s Democratic Party (PDP) behave the way he did at the National Collation Centre where the elections results for the 2015 Presidential and National Assembly elections quartered, it is easy to compare Orubebe’s actions to those of Matthew Harrison Brady at the end of the film Inherit the Wind. Brady in the film gave a hysterical even insane outburst having lost a classic case Darwinism versus the Bible, he being on the side of God. 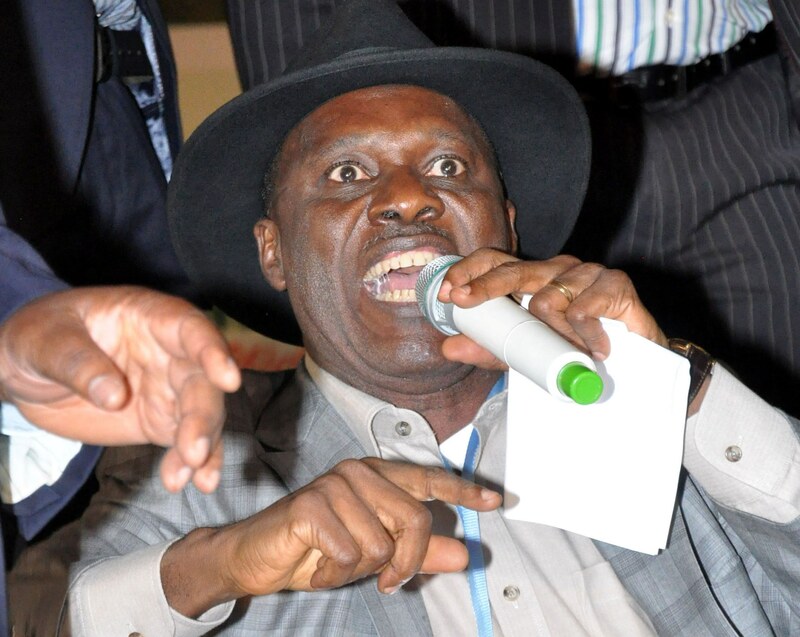 Orubebe was fiery, indignant, overbearing, desperate, vehement or disruptive but he was not insane. On Election Day and the days of vote collations and announcements that followed there were countless (subdued and silent) Orubebes on all sides of the political divide in Nigeria but more pronounced and extensive among PDP politicians, their patrons and clients. Orubebe, singularly, was the public window into hearts and minds of many who lost out at the ongoing elections. His voice, his vehemence, his defiance, his indignation, his pain were all the ramblings of a man who could not accept defeat. Loss is hard to bear whether in estrangement, bereavement, dispossession etc. especially when it was unexpected. PDP never expected to lose. The cost of hubris is something these elections will teach Nigerian politicians if they will learn. Many in Nigeria see democracy only in benign terms and with benign expectations. Such is thoroughly misleading and always results in a harsh sober awakening mostly for the voters. This will make them judge Orubebe’s tantrum very harshly. Free and fair elections are rarely free and fair except for in very few nations on the planet. Vote buying and policy buying (lobbying) is perennial and legal in the United States. There is the uncritical expectation of sportsman-like acceptance of defeat even though there is untold bitterness in defeat in all lands and all sports. In 1969 Honduras and El Salvador fought a war precipitated after a soccer game (though not the primary cause) and soccer games helped in the disintegration of Yugoslavia. Then there is the expectation of increased good governance and reduce levels/scope corruption at a time when globalisation democracy neoliberalism has created an entrenched environment enabling the opposite to happen. Democracy in Nigeria is nowhere near resolving ethnic crises among the 2015 elections has created a new arena / dimension for ethnic politics which we hope will do more good than harm. Ethnicity together with corruption and misgovernance are perpetually ruinous to the Nigerian state. There are also angry desperate politicians and special interest groups who do not accept defeat especially in court cases disputing election results. Orubebe did apologise swiftly for his now infamous actions but it seems many are neither tolerating nor accepting it. His well-nigh hysteria in front of the nation and the world’s media was unquestionably unbecoming of a statesman. However, he will be politically rehabilitated in the near future; he should be able to ‘bounce back’ with some self-reinvention and as the Wole Soyinka on Muhammadu ‘moments’ have exemplified, people seen as heinous devils today can be thoroughly forgiven and supported tomorrow. Maybe the public is simply fickle. Nevertheless, Orubebe’s tantrum inadvertently created a contrast that made President Goodluck Jonathan’s swift and humble concession of defeat message to Muhammadu Buhari, his opponent, in the presidential elections ‘monumentally honourable’. Some will dispute this in an attempt to dismiss anything good Jonathan did or will do as president but history is something he has made with that act and will be seen so much more clearly after the election fever has subsided. « Are Leaders or Followers to Blame for Corruption? Rather than just comment, my question is what would have been the case if PDP/Jonathan had won the election? Yes there were several citizens who’s grievance resonated with his outburst but seeking redress in the manner which he did expressed nothing but desperation. Like they say a drowning man could careless for water, so he could care less of his status and integrity but express brazen folly. Yes he’s mad! Clem O! I do not conduct online diagnosis of people’s health and I am not doctor but there has been plenty of such during these elections in question, Buhari’s health most of all. One can credibly speculate that APC might have been nastier if they had lost the elections, whoever, that is counterfactual.